Now, it is true that we wash our sinks every day, or we think we do, because of all the soap and clean water that goes through it every day. But did you know that the sink can even be dirtier than the toilet? Yes, the water that you use to rinse the sink might be adding more germs to your sinks than you know. It might look clean (the sink I mean), but it holds lots germs in it, making it dirty. So it is essential that you scour your sink once in a while to get the dirt and the germs out. Cleaning your sink once in a while helps keep the dishes cleans (and germ-free) and keep you healthy too unless you want an unsanitary sink that you’ll be doing your dishes in. To get this done, you would have to put on your washing gloves, grab some cleaning supplies and get to work. 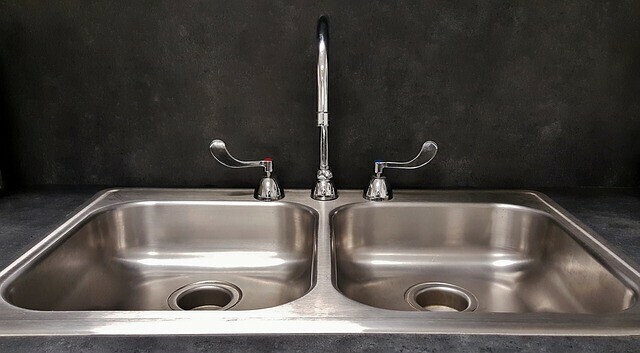 This article will focus on the supplies you would need to clean your sink, and the four steps you’ll need to take to make the job an easy one. Now, although both the lemon juice and the white vinegar are handy in cleaning the sink, it may not pose any useful effect to some sinks (so your kind of sink would determine whether to use these products or not). If you have this kind of sink, then avoid contact with acid or salt. Also, ensure that your stainless steel sink does not come in contact with any form of bleach or ammonia. Do not also use a sponge that has an abrasive texture when cleaning or washing dishes in the sink; if you do, you might end up denting and damaging its beautiful finishing. Although most people think that you can use lemon to clean the sink, irrespective of its acidic properties. While this may be the case, when you use the lemon do not leave it on the sink for too long, so you don’t damage the sink. Skipping it altogether is better. Ceramics scratches easily, so for this very reason, you should not use any material that has an abrasive side, so you don’t damage the finishing of the ceramic. Most (if not all) cast iron sinks have an enamel coating on it, which means that when scrubbing it, utmost care must be taken to scrub it. It follows, therefore that you should avoid abrasive cleaners like wire sponge and sponge pads. If you’re using this kind of sink, do not use harsh chemicals on the sink. Abstain from using acid, if the sink has a patina if not may either be stripped away or damaged. One thing about stone is that they are porous, meaning they know how to absorb water and other substances that they come in contact with. This substance may affect the sink, and in the long run, affect the dishes. So it is best you avoid harsh substances. You could use mild acid in vinegar and lemon juice to clean the sink. Do not, however, leave it sitting on the sink for so long, unless you want to damage your sink. First things to do, is to clean out your sink, and you do this by rinsing it. You just remove the debris from the sink when you rinse it, this way you can work better. The next thing you’ll do is dusting the inside of the sink with the baking powder. When you’ve done that, you can now go on to scrubbing the sink. When you put the soda on the wet surface of the sink, it will form a paste, and it will help you get all the stubborn debris off the sink, as well as take care of the stains. Your sink should also look polished as well. Done with the debris removal? It’s now time to attend to your drain flaps, the handles, and the faucets. You can also use the baking soda paste here as well, but rather than use the sponge, use your brush instead; this way you can get into the tight spots. The fourth thing to do is to rinse the sink out. Then you get a paper towel to wipe the faucet and handles until the baking soda is thoroughly cleaned out. The fifth and final step is an optional step. If vinegar will damage your sink, avoid it, but if it’s good for your sink, then, by all means, use it. But you’ll soak it in a paper towel, and then use it to line your sinks; interior, and the faucets and handles as well. Let it sit for twenty minutes then take off the paper towel. Then you can finish cleaning the sink with water and dish soap. Sometimes, a stain just won’t come off, and it can leave one feeling angry. So what do you do? Just concentrate on the spot. Here, you mix lemon juice with borax, then scrub hard. Do not, however, be too abrasive when cleaning the surface; you don’t want to damage it (especially since you’re using borax). On the alternative, you can use baking soda and vinegar. Try to avoid harsher products like bleach and ammonia, or hydrogen peroxide, unless necessary. Using them might only cause damage to your sink. The best way to care for your sink is through careful cleaning. But what way is the best way, to give this form of cleaning to your sink? The more you clean your sink after every use, the cleaner it gets. The thing to do in this instance is to consistently clean your sink basin thoroughly after every use, then wipe it off, so the surface may dry. When you do this each time, your sink stands a chance of staying clean all the time. Although you may be cleaning your kitchen once in a while, it is essential that you also thoroughly follow the four (five) steps listed above, when cleaning the sink so that it can stay germ-free. Lastly, avoid leaving food on the sink for too long. Beverages like coffee and tea are also to be avoided as they contain notorious substances that would leave your kitchen sink dirty. Having a clean sink, and by that I mean, free from germs (not seemingly so), is one of the best ways to not only keep your sink clean but also to ensure that your hygiene is catered for. The saying goes, “cleanliness is next to godliness” is something that we should all imbibe, this way, we can keep ourselves healthy.